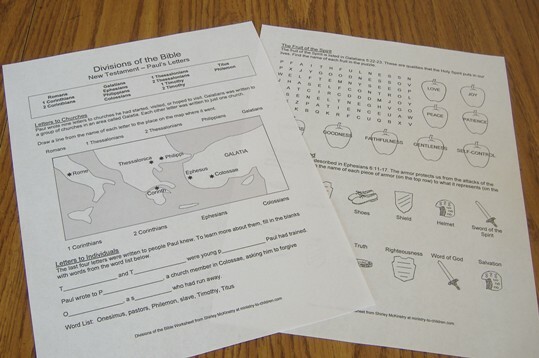 This is part of a series of worksheets based on the divisions of the Bible. The purpose is to help children who are already familiar with many of the Bible stories to understand how they fit together to make the whole story of the Bible. Click here to download the worksheets. This worksheet focuses on Paul’s letters in the New Testament. It has two pages that can be printed back to back. Pencils are needed; crayons might also be helpful. Tony Kummer (Editor) reviewed & updated this page on : September 16, 2013 at 10:08 am. All our content is peer reviewed by our readers, simply leave a comment on any post suggest an update.